18 years have passed since the February 15 international conspiracy against the Kurdish People’s Leader Abdullah Öcalan. 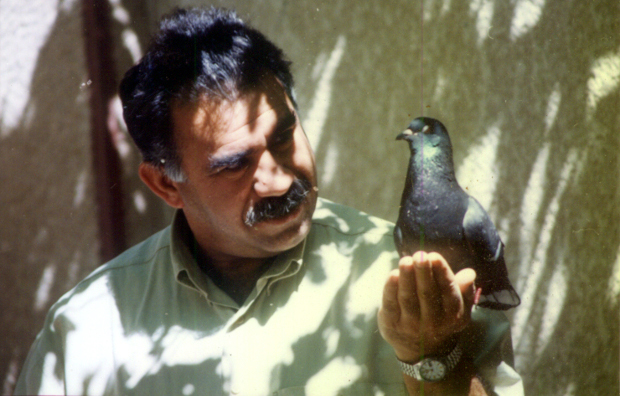 In the 18 years that have passed, Öcalan has sought a peaceful solution to the Kurdish issue under the strictest isolation conditions. In the face of all of Öcalan’s peaceful methods, imperialist powers and the Turkish state carried out annihilation attacks on the Kurdish people and the Kurdish Freedom Movement. Botan guerrillas say that Öcalan, the Kurdish people and the Kurdish Freedom Movement have answered all attacks with a great resistance, and state that they will continue the struggle until Öcalan and the Kurdish people are free in the diaries they keep. ANF gathered some excerpts from the diaries guerrillas record their thoughts and feelings in on the Conspiracy of February 15. Asmin Roni: A year of fire we have left behind! The hearts of our comrades who left our side, our comrades who stepped into the mountains filled with hope, all of our hearts beat with yours. We left another year behind to open the door for a cold winter. We are meters deep in the ground. It feels like these are not caves but underground cities! The Katos! The great, the mighty Katos! They are the “Dark Mountains”, the enemy can’t enter the depth of this place, the Katos are light for us. This war we wage in the embrace of our mountains, continue stronger now in these underground cities, along with the memory of so many of our comrades, with your philosophy. We read your words again. It’s like these words are coming from your lips, with you right beside us, with deep meaning in your eyes. Meters deep in the ground, we are illuminated by your ideas and your light. We wash our hearts in the glow of your philosophy. My Leader! With your ideas that the world is deaf and blind to and afraid of, now we question our deficient comradery, and our insufficient fight, and prepare for another spring. We the women you have always been a comrade to, now start every day with feelings of revenge and fury. We think of the spring and of you. Maybe in Amed, maybe in Cudi… With the people, we dream of you in the lands you belong in, in your country. For this, we are preparing for a harsh war, a new spring and a new year. This spring our guns will not be silent, until we have victory in our hands! Gulan Çekdar: Any person who call themselves human and any Kurd who bases their life in honor should remember this forsaken day for as long as they breathe. In the history of our society, the annihilation and the denial that started with the Sheikh Said uprising on February 15, 1925 has peaked with the international conspiracy of February 15, 1999. The Leader has been taken hostage. In his person, free spirit, free will, free thought and free life have also been taken hostage. Despite the years that have passed, we live through this ominous and dark day with the same heart break. Even though the time and the place change, the thoughts and the feelings stay the same. For the same to change, we need to see the Leader among us. The path for that is through a strong fight. We can only make up for our deficient comradery in this way. Last year around this time, we were by the skirts of the unique and unpassable mountains of Cilo. Just like this year, we were with a group of women in Cilo. Being in the Katos, the “Saw Mountains” as they are called in Turkish, this year in Botan is exhilarating. Living and fighting in the lands where Çekdar, Şerif, Aram and Jinda have shed their blood means a great value for me. Today is February 15! As the Kurds say, the “Dark Day”. The day our Sun, our Rebêr Apo has been physically taken. And the day that the whole world came together to try to touch our Sun. Our words can never be enough to describe this day. Today, I walked through the bloody pages of history for Kurds once more, when I thought of Rebêr Apo, Sheikh Said and Seyit Rıza. We didn’t eat, we didn’t drink today. All comrades read and wrote the whole day. Thinking of February 15, understanding it fills us with feelings of revenge and fury. Rojbin Mahir Derik: With the conspiracy on our Leader, they tried to destroy the Kurdish people and our Movement. The history of freedom will demand pay back for this, sooner or later. Our Leader has displayed great resistance in thought and in life against the conspiracy forces. And in their midst, he kept his human dignity, and showed the truth of the moral society to the whole of humanity. He exposed the secret tricks and the dirty politics of these powers and unmasked them. In this, he voided the aims of the conspiracy, and planted the enthusiasm, excitement and moral of this resistance to the hearts of the Kurdistan Freedom Fighters. And our people today have taken to the streets around the world with this spirit of resistance. From 7 to 70, everybody is fighting against the conspiracy of February 15 with no fear and much fury. All are fighting with a spirit of sacrifice and rising up for serhildans. The Kurdish Freedom Guerrillas have voided the conspiracy with the resistance they displayed. And they are fighting for our Leader’s freedom in every arena. This fight will turn into a great resistance in the coming year. Until our Leader and our people are free, we will increase our struggle and smother the conspirators in their own conspiracy.